First log in to the ChemBox website at https://chembox.ch.cam.ac.uk. 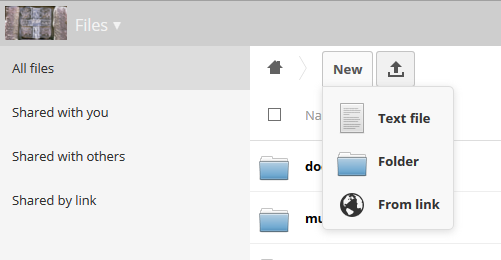 After logging in, if the folder you wish to share does not already exist, create a new folder by clicking the New button and choosing Folder from the list of options, and enter the name of the new folder when prompted. When prompted, enter either the username of the user (which will be their CRSID, e.g. tkd25 in the screenshot below) or the name of the group. If you are unsure if a suitable group exists, please contact the Computer Officers who can set up groups so you can easily share folders/documents with e.g. all current members of your research group without you having to manually maintain a list of group members. You should then see that the folder has been shared with the specified user or group - note in the screenshot below that the folder icon has changed, and the shared folder now has the word Shared displayed to the right of the folder name and icon. By default, a person who has had a folder shared with them can both edit the contents, and share the folder with other people themselves. If you do not wish them to be able to do this, untick the can share box. 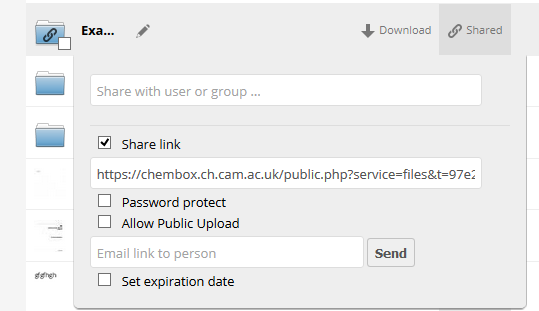 Please note: unticking the "can share" box will not prevent the person from downloading the shared content and re-sharing a different copy of the file(s) - possibly elsewhere in ChemBox, or possibly via other third-party filesharing sites. To unshare a previously-shared file, hover over the folder, click the Shared button (see screenshot above), and then click on the rubbish bin icon next to any user/group who should not have the file/folder shared with them. You can optionally share files with people who do not have ChemBox accounts. Hover over the file/folder, click Share, and then tick the Share link box. To unshare a file that you have created a Share link for, hover over the file/folder that is shared, click the Shared button, and untick the Share link box.